← Saka, the thrift collector don port. It is common knowledge that as a country we have jettisoned serious literary reading for frivolities like watching television, the movies and listening to pop music (cold media according to McLuhan). The consequences are evident in the declining knowledge base of young Nigerians who year in year out post pathetic grades in standardized tests into universities and tertiary institutions. For a country that boasts the ‘grandfather of African literature’ and Nobel Laureate in Literature as citizens, we can categorically say that the golden age of Nigerian literature came in the 1960’s -1970’s, during the hey days of the likes of Achebe, Soyinka, Clark, Okigbo, Amadi, Ike, Ekwensi to name a few of the giants. One writer who has bucked the lack of sales even in Nigeria is Chimamada Adichie, the fresh-faced, braids wearing, effusive, media-savvy author, whose three novels and a book of short stories have won a ‘wall full’ of accolades, earned her incredible money and celebrity status and made her a darling of the media and public on both sides of the Atlantic. At her recent reading of her critically acclaimed new novel, Americanah (with a stress on the nah), at the Terra Kulture in Lagos, the hall was packed full of young people, who are always drawn to her realness, her star power and wit. Her novels are written in simple language (story-teller mode), an attribute best exhibited by Chinua Achebe, and that is the reason she is seen as the literary daughter and heir apparent to the late icon. In her interviews (there are ‘hundreds’ of them), she routinely acknowledges the influence of Achebe and how reading his novels inspired her. Like Achebe, the West genuinely thinks her a genius, and this is evident in Americanah being reviewed extensively by nearly all the major newspapers in the US and the UK. Achebe’s heir arguably is now the marquee literary voice of Nigeria. And she takes the job seriously: refusing to speak like an Americanah, continuously writing about Nigeria and Nigerian issues, remarkably acclaiming her ‘Nigerianness’ wherever she is in the world. Back home in Nigeria she does a round of the media circuit nearly every year and is such a fan favourite – especially with the men – that many were ‘shocked’ when they discovered she was married. In Americanah, Achebe’s heir writes about hair, race and love. And from the reviews she seems to have hit bull’s eye. Obviously, she’s been hitting ‘the eye’ ever since, as her second novel Half of a Yellow Sun is currently been made into a Nollywood movie. 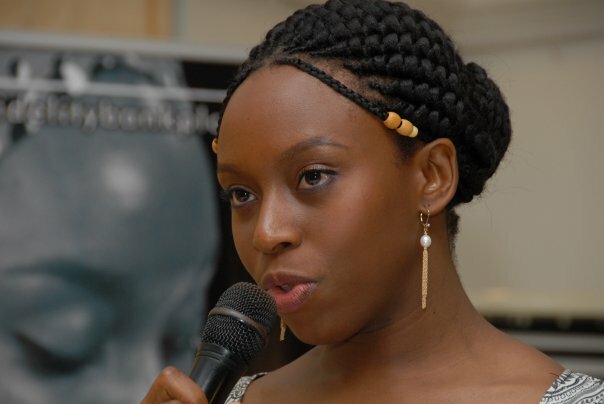 That Chimamanda has got plenty of star power is not in dispute; The Scotsman described her as “more film star than writer, and is apparently worshiped like one in Nigeria too.” I believe the Jonathan Government could tap her aura and deploy it to galvanise the ‘back to the book’ programme. Konga is a legend no doubt, but a bushy mane and white beard (though gloriously professorial) can hardly compete with the beautiful, movie-star looks of Adichie. Added to her wit and story-telling abilities, and her penchant for tackling post-modern themes, I think she can get the young people back to reading. And she is already doing so; her take on African women’s hair has ruffled plenty of feathers and egos, and obviously whetted the appetite of an army of Nigerian women who are eager to read her take on hair. Well to give them a snippet, Adichie speaking to the Scotsman chides, “In Nigeria now the craze is for Brazilian hair. It’s very expensive, takes hours, and goes down to your waist in huge waves. It looks ridiculous.” I support her. This entry was tagged Americanah, Chimamanda Adichie, Chinua Achebe, Soyinka. Bookmark the permalink. She is truly Achebe’s heir. Same style of writing (very simple words, bringing to the fore everyday life issues, incorporation of Igbo words in the stories). I hope to see her stay on harder stuff like she did in ‘Half of a yellow sun’. Achebe’ heir? Hardly. Achebe as a writer had a moral compass and foundation from which his writing was guided. Talking about warped unsophisticated contrived feminism: “girls should not be looked down upon for sleeping around like boys” is precisely the type of garbage the West will champion and ultimately the the kind of literary dribble Africa does not need.